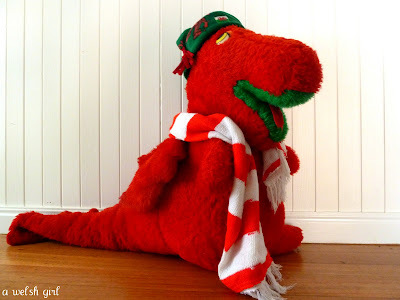 A Welsh girl in Australia: A Rugby World Cup tour and introducing Taffy. A Rugby World Cup tour and introducing Taffy. Those that have ﻿read here before will know that we are a rugby supporting family and at the moment we are on a Rugby World Cup tour. The Rugby World Cup is currently being held in New Zealand and to cut a long story short - for a variety of reasons the plans to actually get there to watch some of the matches just didn't happen. This was also a case for others that we knew so one person had the ingenious idea of creating a 'stay at home' tour. This means that each couple involved will host an Australian match in their home. The hosts provide food and drink associated with the countries playing and we all gather to watch the game. Yesterday we 'toured 'to watch Australia v Italy and during the game we snacked on pizza, followed by a delicious meal of lasagna together with some Prosecco sparkling wine and some robust reds. Our hosts had decorated their place with appropriately coloured balloons and images of Italy and have really set the standard now! Neil had his England jersey on and Sibs had her New Zealand one and everyone else apart from me had an Australian Wallabies jersey.... I must find a Welsh one quick! In the absence of a Welsh jersey I have Taffy. Taffy has been around for a while. He was won in a 10 pence raffle when I was a little girl many moons ago. He's done a bit of travelling, even coming away to University with me twice! He moved with me to England and somehow got relegated to a life in the attic for a while.. When Sibs came along he was rescued and given a bit of a clean and became a family member again. He now lives in the playroom and occasionally gets dressed up (when he is affecionately referred to as Taffelina!) and on rugby days when Wales are playing he is allowed downstairs to sit on the sofa to cheer on his home nation! So if we can't get to the 2011 Rugby World Cup, the event is definitely coming to us. Our house is hosting Australia v USA so I'll be thinking up some American style cuisine and decor. Should be fun. Being a Kiwi originally, I'm all for the All Blacks..but don't mind if the Wallabies are in there either! My sister in NZ says they are having a ball in NZ with all the festivities at the moment. Being born and bred in South Africa, they'll always be my #1 team. I also support England coz that's where I lived for 8 years. I also support Australia coz that's where I live now. That's all well and good if none of these teams are playing each other. I have no idea which jersey to wear if any of them are playing each other! 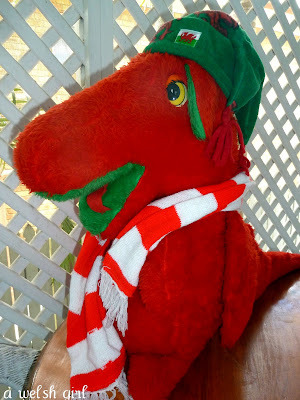 My husband is Sth African; but I do have Welsh ancestory, so I'm with you. Taffy is lovely!